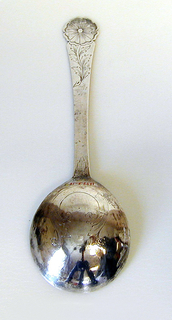 A spoon with rounded fig-form bowl, the flat stem flaring to flower-form terminal. The obverse of the stem engraved with scrolling foliage topped by engraved flower head. The reverse of the terminal engraved with flower heads and foliage. 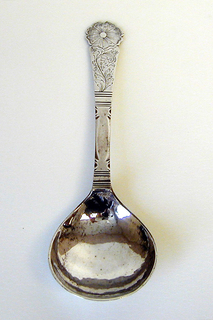 The reverse of the bowl with foliate terminated arc.